College and university students are now just entering or returning to school after summer vacation. However this year things are a bit different. Many students are asking this question: Are we going to go on strike? Since student strikes and mass street protests are still going strong in Quebec, many post-secondary student activists are working to spread the strike across English Canada – at least in Ontario where fees are the highest. The Great Recession, the result of an overproduction crisis compounded by a high stakes financial gamble lost by the super rich, is now being used as an excuse to raise tuition fees and slash a variety of public services. It is also the rationale for furthering the agenda of corporatization of universities and colleges. Sky rocketing tuition fees range anywhere from $6,000-$10,000 a year for a full course load. To some, these charges seem manageable when compared to the crippling debts and related interest charges they must bear afterwards. Students should realize that now is the time to hit the streets and demand what has always been our right: Free, quality public post-secondary education! Students should begin organizing for something more potent than a mere single day of protest. Sadly, the various student unions have been vague about their plans for action. They claim to be waiting until the school year resumes to unveil their strategy. It is obvious that an action plan should be made public as soon as possible, particularly since Ontario Premier Dalton McGuinty lied about reforming the tuition debt regime — not to mention McGuinty’s current war on elementary and secondary school teacher’s fundamental bargaining rights. No longer should students and education support workers trust the false promises of McGuinty and his Liberal party – bought and paid for by the 1%. With rebellion in the air and high enthusiasm for following in the footsteps of our Quebec student comrades, one would think that the Ontario student revolt will happen any day now. Sadly this is not the case, largely due to the existing student union leadership. Instead of demanding free post-secondary education and the cancelation of student debt, student bureaucrats are playing it safe. They ask for small concessions from the provincial government, such as freezing tuition fees, or lowering them by a small percentage over a period of time. 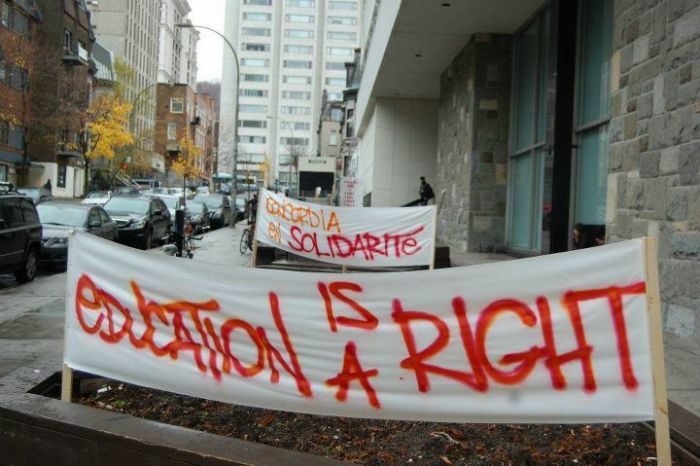 Not only would these concessions do very little to help the least affluent students, but they’d fail to affirm the most vital aspect of the growing student movement globally — that education is a RIGHT, not a privilege! It should be the rich, whose system caused the economic crisis, who ought to bail out the economy, and not only that, but to pay for tuition-free education for all. At a time when Ontario student unemployment is the highest in the country, at a time when obtaining one’s OSAP cheque is an Olympian challenge, at a time when universities are more corporate-branded and controlled than ever, we need bold, not petty demands. Now is the time for rebellion, in the classes, in the work places, and on the streets. The student union leadership has a choice. Lead, follow, or get out of the way. On every campus, students should organize debates, conduct strike votes and resolve to initiate action to drop fees. This is the perspective that Youth for Socialist Action will be advancing everywhere. Join us. Together we can fight to win.